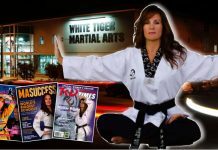 Paulie Zink began studying yoga and martial arts as a teenager. While he was in college he met a Kung-fu master from Hong Kong named Cho Chat Ling. Master Cho had been imparted with secret martial arts knowledge by his uncle and was obligated to pass on the legacy. He wanted to choose a proficient, worthy practitioner who could show the art to the western world. He found in Paulie Zink the potential and the tenacity of spirit necessary to meet this aim. After some time Master Cho chose Paulie to become his sole protege. Master Cho came to Paulie’s home and instructed him privately every day for six to eight hours. About three hours of his daily practice were devoted to flexibility training and Chi Kung. Paulie was taught the Taoist arts of yoga and Chi Kung as a foundation for his martial arts training. Master Cho taught Paulie three distinct Kung-fu styles (collectively called Tai Shing Pek Kwar) combined into a discipline that demanded tremendous mental concentration, harsh physical exercise, and esoteric spiritual practices. For seven years Paulie Zink continued his daily intensive level of study with his master while he simultaneously developed the his own art of Yin yoga. After seven years time Master Cho began to taper the frequency of his visits, although Paulie continued to train just as vigorously. By the tenth year Master Cho declared Paulie to be his own master and his training ended. He told Paulie he had transmitted to him in ten years time what would usually require twenty-five years or more to learn. Paulie is the only westerner to be traditionally trained in the secret knowledge of the art of Tai Shing Pek Kwar in a direct Chinese lineage from the arts’ originators. Master Cho never charged Paulie for his tutelage. Master Cho insisted Paulie compete in the martial arts arena. Paulie entered in the solo “Empty Hands” and “Weapons” divisions of approximately one hundred martial arts tournaments from local to regional to national levels. He won the Grand Championship in all of them, often in both divisions. 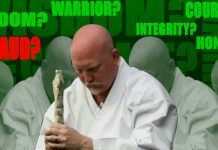 Master Zink’s tournament career culminated with him winning the Grand Championship at the Long Beach International Karate Championships three consecutive years. Master Zink has been inducted into three Martial Arts Halls of Fame. Master Zink has co-authored two books on Monkey Kung-fu. He has starred in a total of 15 Martial arts and Yin Yoga training videos produced by Unique Publications and Panther Productions. 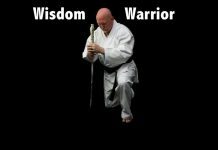 Dozens of articles about Master Zink and his art have been published in several major martial arts magazines. And he has been featured on many magazine covers. Master Zink was featured in the BBC series “Jerry Hall’s Gurus”, a documentary on spiritual teachers produced by Tiger Aspect Productions, UK. As the founder of Yin yoga, Master Zink continues to evolve his Taoist art by adding postures, variations, and insights. Through many years of study, practice, and teaching he has developed the ancient Taoist tradition into his own distinctive and dynamic style. Students often ask Paulie if he was always naturally extremely flexible. He was not. As a teenager he had average flexibility. It wasn’t until he trained long and hard in Taoist Qigong and Yin Yoga that he developed his exceptional skill.